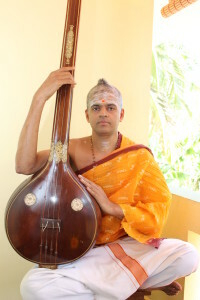 Chethalloor Edamana Vasudevan Namboothiri is a disciple of carnatic exponent Olappamanna Vasudevan Namboothiripad. He graduated with MA Music from Delhi University. He has also learnt Sanskrit under the tutelage of Shri VR Ramakrishnan. Hailing from Palakkad district of Kerala, he now resides in Trissur.